The 2019 Nebraska Book Festival has been scheduled for September 7, 2019 at UNL City Campus Union in Lincoln, NE. For more information visit the official Nebraska Book Festival website! Activities begin Friday evening, July 14, 6:00 p.m. at Constellation Studios, 2055 O Street in Lincoln. This opening evening event is sponsored by Karen Kunc, Willa Cather Professor and Professor of Art at the University of Nebraska-Lincoln (UNL). Nebraska State Poet Twyla Hansen and Daniel Simon, Editor of Nebraska Poetry: A Sesquicentennial Anthology, 1867–2017 (Stephen F. Austin State University Press, 2017) will celebrate 150 years of Nebraska’s rich literary history with a program that will draw from the NE150 anthology. A letterpress keepsake will be offered to attendees. Saturday activities at Union Plaza in the Antelope Valley neighborhood will begin at 9:00 a.m. and feature presentations by authors, who will read and discuss their work. Participating authors will answer questions from the audience and be available for book signing. Literary and cultural organizations, publishers, and vendors will be present. Indigo Bridge Books will sell books by regional authors and host author signings throughout the day. Family programming will be emphasized with Lincoln City Libraries sponsoring puppet shows by Mesner Puppet Theater, a globally known professional theater company. The Nebraska Writers Guild will offer Presentations for Writers and a variety of panel discussions are planned, including one on publishing options. 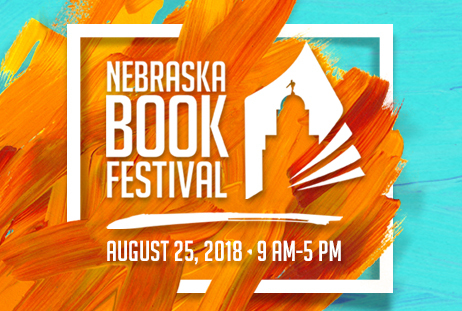 The Nebraska Book Festival is coordinated by University of Nebraska Press and co-sponsored by the Nebraska Library Commission, Nebraska Center for the Book, Lincoln City Libraries, Indigo Bridge Books, and Redbrush. Programing sponsors for the Nebraska Book Festival are Nebraska 4-H, Junto Wine, Concierge Marketing and Book Publishing Services, Nebraska Writers Guild and Constellation Studios. We are actively seeking additional sponsors to ensure that we have fantastic author presentations and activities. More details about presenters are forthcoming. 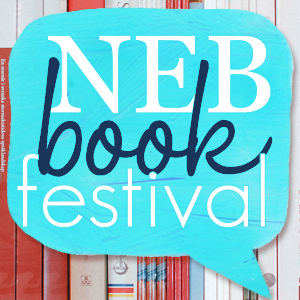 Keep up with the Festival at the official Nebraska Book Festival website. The 2015 Nebraska Book Festival marks the 23rd annual book festival dating back to 1991. Historically, the Nebraska Book Festival has offered high-quality speakers, presenters, moderators, and workshop facilitators. The change of name from Nebraska Literature Festival to Nebraska Book Festival broadens the scope of the event to include contemporary Nebraska writers and books, as well as the great classic writers of Nebraska’s literary heritage. 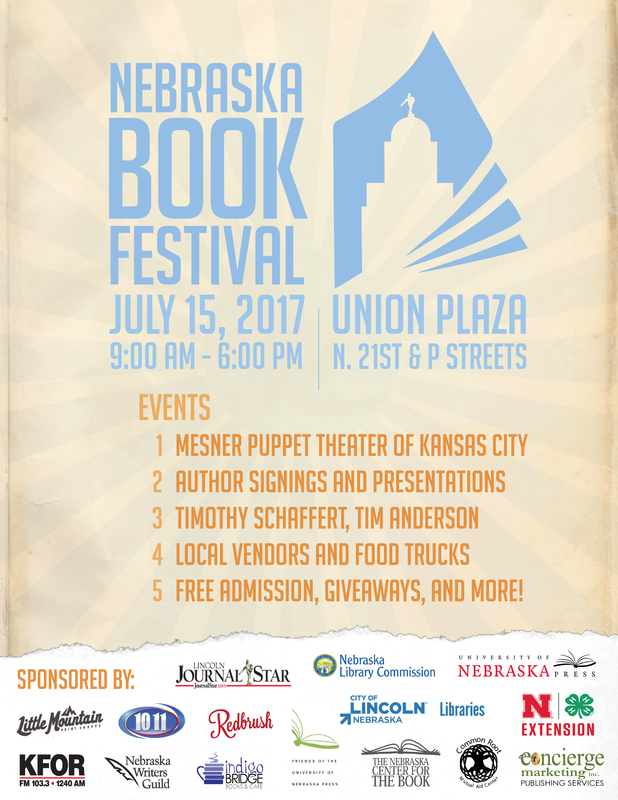 The festival is dedicated to Nebraska writers and Nebraska books. It celebrates the reading and writing life of Nebraska. The goal of the festival is to celebrate Nebraska’s literary heritage and contemporary authors and to stimulate public interest in books, reading, and the written word. By gathering together contemporary writing talent of our state, and those involved with the literary heritage of Nebraska, the festival provides an opportunity for participants to cultivate an understanding of our history and culture.